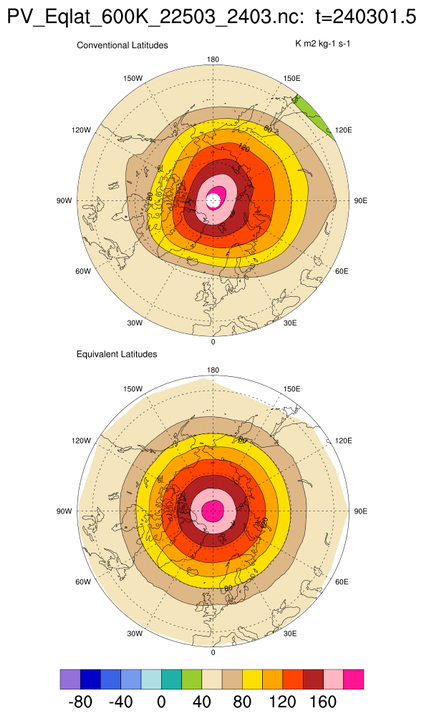 Equivalent latitude is often used when analyzing potential vorticity (PV) and polar vortex behavior. The edge of the vortex is defined as the maximum first derivative of PV with respect to equivalent latitude. You can use NCL's triangular mesh capability to directly contour equivalent latitudes which are function of time and longitude. Bodecker Scientific provides a tutorial of how to compute equivalent latitude from potential vorticity. For more information on non-uniform grids that NCL can handle, see the document "Non-uniform grids that NCL can contour." The eqlat_0600K variable is a function of (time, lat, lon). The lat/lon information must be provided by setting the resources sfXArray and sfYArray. Further, the data array must be one-dimensional (use ndtooned).